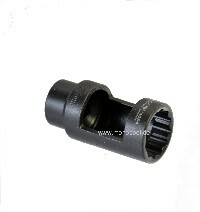 Leakage pipe plug for all nozzle holders. We deliver this plug in high quality and resistant material (RILSAN). This plug is much stronger than the common rubber plugs, which sometimes get loose or lost without intention. We recommend to renew the leakage pipe and leakage pipe plug, when starting to drive on veggie oil or after changing the nozzles.